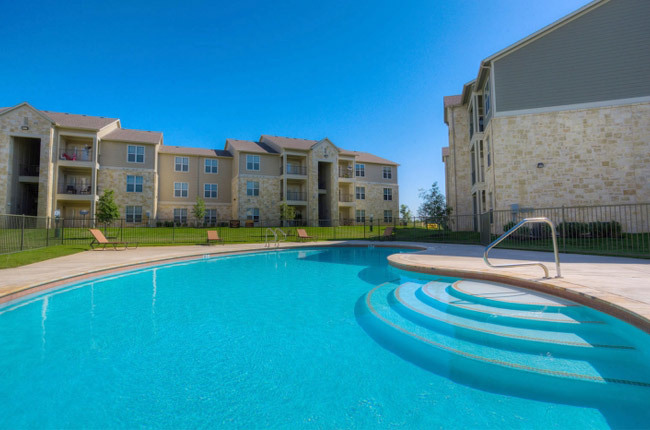 Nestled in Floresville, Texas, Oakland Hills Apartments is a wonderful community that boasts classic styling, incredible amenities, and a serene setting. At Oakland Hills Apartments, our community supplies a continuous rhythm of energy and style. Our goal is to provide our residents with amenity-rich contemporary living. Offering a variety of one, two, and three bedroom options, our floor plans feature expansive walk-in closets, washer and dryer connections, and a private patio or balcony. Our community amenities allow ample opportunity to lead an active social life. In fact, we encourage you to commune with other residents! Whether it is an invigorating workout in our exclusive fitness center, taking a dip in our sparkling swimming pool, or staying connected in our professional business center, there is always something to enjoy when you live at Oakland Hills Apartments! Settled along Paloma Drive, Oakland Hills Apartments offers all the convenience you could ask for in an apartment community. Centrally located in Floresville, Texas, our community features close proximity to US Highway 181 and State Highway 97, making it simple to navigate the city. For your fill of sunshine, greenery, and recreational activity, head out to City River Park, Pecan Park, or the City Swimming Pool. If you prefer indoor activities, foodies will marvel at the many popular dining destinations within the area such as Trail Rider’s Steakhouse, Thai Grill, and Lew’s Patio & Grill. And it has never been easier to stock up on necessities with a Walmart Supercenter, One Stop, and Bradly’s Food Mart nearby. Call and schedule your personalized tour of Oakland Hills Apartments today. You will soon discover all of the benefits of living in our beautifully unique community.